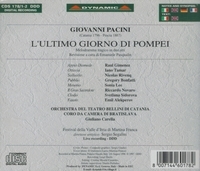 “L'ULTIMO GIORNO DI POMPEI is an opera (dramma per musica) in two acts composed by Giovanni Pacini to an Italian libretto by Andrea Leone Tottola. It premiered to great success at the Teatro San Carlo in Naples on 19 November 1825 followed by productions in the major opera houses of Italy, Austria, France, and Portugal. When Pacini's popularity declined in the mid-19th century, the opera was all but forgotten until 1996 when it received its first performance in modern times at the Festival della Valle d'Itria in Martina Franca [abopve]. L'ULTIMO GIORNO DI POMPEI influenced either directly or indirectly several other 19th-century works, most notably Karl Bryullov's 1833 painting, ‘The Last Day of Pompeii’. 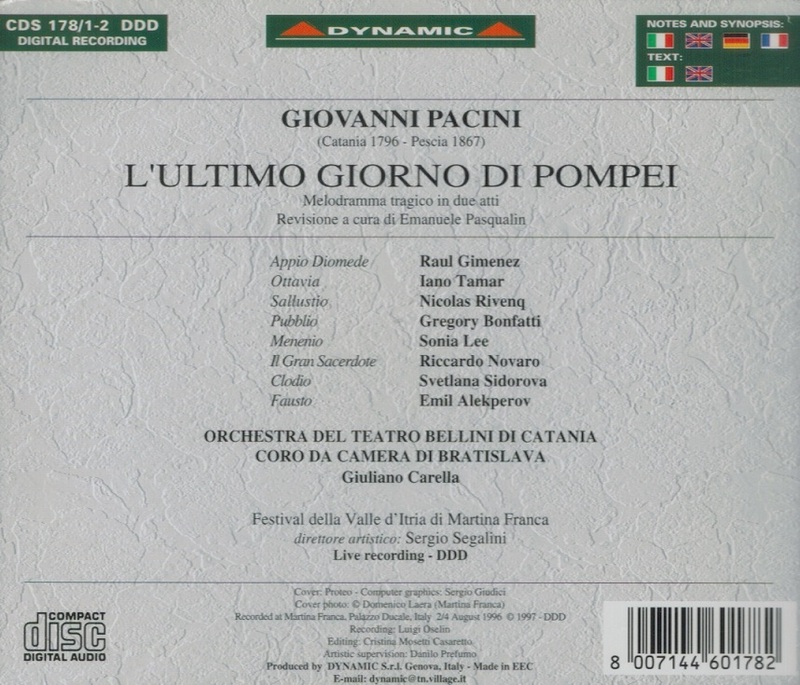 L'ULTIMO GIORNO DI POMPEI was the third of Pacini's operas to premiere at the Teatro San Carlo in Naples. It was commissioned to celebrate the name day of Queen María Isabella of the Two Sicilies. The libretto itself was written by Andrea Leone Tottola. However, the basic outline of the story and the idea of setting it in Pompeii at the time of the eruption of Mount Vesuvius in 79 AD came from the Teatro San Carlo's resident scenographer, Antonio Niccolini. 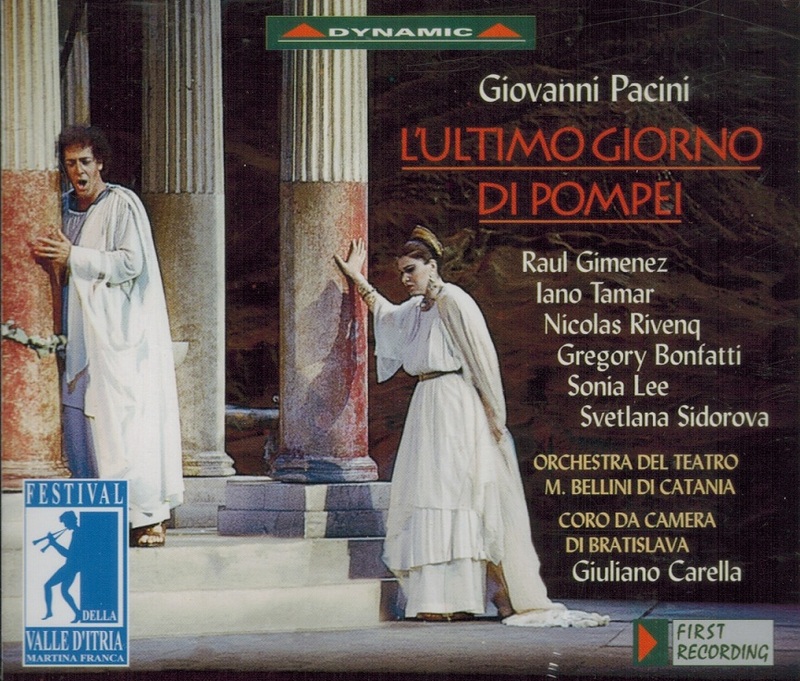 Although the setting and the English translation of its title are similar to that of Bulwer-Lytton's novel ‘The Last Days of Pompeii’, the opera predates the novel by almost 10 years and has a completely different plot. The opera premiered to great success on 19 November 1825. Nicolini's production was an expensive extravaganza involving numerous changes of sets, complex lighting, and the use of real explosives. The spectacular climax depicting the fiery eruption of Mount Vesuvius was accompanied by a simulated earthquake and lightning as nine gauze curtains painted with clouds of ash and fire were raised one after the other to reveal the volcano. According to a contemporary account, when molten lava appeared to flow towards the front of the stage, the effect was so realistic that people in the stalls were terrified. The set designs for the Naples premiere have been lost. However, multiple copies of Alessandro Sanquirico's designs for the 1827 La Scala production have been preserved. Kenneth Lapitan, a curator at the J. Paul Getty Museum, has proposed that Sanquirico's designs probably followed Nicolini's production quite closely. “Raúl Giménez is an operatic tenor, particularly associated with the Italian bel canto repertory, in which he is considered one of the best exponent in recent years. Giménez was born in the small town of Carlos Pellegrini, Argentina. He studied at the Music Conservatory of Buenos Aires and made his operatic début at the Teatro Colón as Ernesto in DON PASQUALE, in 1980. After appearing in concert and opera throughout South America, he came to Europe in 1984, where he made his début at the Wexford Festival in Ireland, in Cimarosa's LE ASTUZIE FEMMINILI.